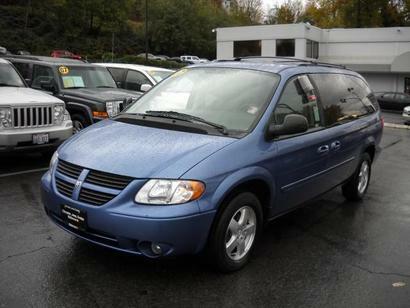 Still Seeking Sanity: Welcome to the family, Smurfmobile! Yesterday was a good day. I went into Bellevue, a city about 100 miles from my house. For you non-Washingtonians, it's just on the other side of the Lake Washington from Seattle. It's actually pretty close to where I grew up, so my Dad had been scouting vans for me around the area. He had found three that we were going to look at. We picked the best one and started there. We didn't get any further. I had taken several pictures throughout the day yesterday, but the battery died in my camera and I didn't have a chance to charge it to upload the pictures before someone (cough Brenda cough) started giving me a hard time about not blogging about the van. So I pulled this pic off the cars.com listing. She's a 2007 Dodge Grand Caravan. She has 32,000 miles, stow and go seating, power doors and liftgate, and some sort of connecty-thingy where you can sync your garage door opener to the van and it'll open you garage door for you. Which would be really handy if, you know, I had a garage. The salesman was awesome. He treated me well, was honest and straightforward and even fed me lunch. Hey, I love a free lunch. As it turns out, we went to the same high school, he was the year behind me. Neither of us recognized each other. I got the van for six thousand dollars less than it's Kelley Blue Book value, and I negotiated my way into a full tank of gas. I'm a happy girl. Emma loves it. "Mommy! Guess what! I have my very own blower thing back here! And my own light! And a cool handle that I can grab hold of if we ever get into an accident, Mommy, if you know we are going to get into an accident, just say, 'Emma! We're going to get into an accident!' and I'll grab my handle and I'll be safe." The only downside is that it's blue. The picture there is muted, it's actually almost periwinkle. Marty calls it Seahawks blue. I think it would be really pretty as the color of my bedroom, but not necessarily my car. It'll grow on me, I'm sure. So there you have it. The great van hunt is over. They took the green machine in on trade, and it did not die before I traded it in (thank you, Jesus!) Now I can move on to better things. You know, like cleaning up pee. Oh thank you thank you thank you, I can now sleep at night!!! It's a pretty color, not as light as I was thinking/fearing!!! What dealership did you end up getting it at? When we had the van we bought it in Bellevue too and had one of the best car buying experiences there, who'd a thunk?! Who was the sales guy???? Just curious now that you said we went to school with him! Welcome to the family smurfmobile. You will get along just dandy with the snowmobile! Wow, that is a nice looking van!! What dealership did you go too? Curious as to the final cost out the door. Just to know what we are up against for an 07. Try driving a "mini" van for 11 years that looks like a service van...I pay tonage on the stupid thing...more then jeremy's truck! Whew! I can finally stop worrying about a family I've never met getting a van I'll probably never see. Sometimes I wonder how come I get so wrapped up in the blogosphere that I can lose sleep! Thanks for the great description.